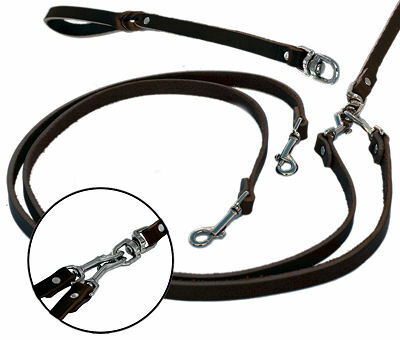 The leash includes an handle, approximately 12" in length, followed by a swivel connected to two individual leashes. These latigo leather leashes are not adjustable. Each leash is made with a snap at each end. Need an extra leash in a flash? Just unsnap one of the leashes and connect both snaps to the dog's collar and shazam ... you have a walking leash. Also available in Nylon in an assortment of colors.